Jason Hartman talks with Platinum’s Local Market Specialist about investment opportunities in the 9th largest metro area in the USA. You’ll hear Jason’s prediction for ROI in Atlanta and a good market overview. 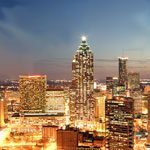 Atlanta represents an investment gem in the southeastern United States. It has spectacular economics from a development and employment perspective that make it a tremendous opportunity for income property investors. With a wide diversity of employers, many universities, and a vibrant cultural presence in the city, Atlanta has attracted a tremendous amount of in-migration from young professionals seeking employment opportunities. Since many of these young professionals choose to rent, the Atlanta market has very healthy rents relative to values. Currently, approximately 31% of listings in Atlanta are from foreclosures.Atlanta’s experience during the real estate bubble and financial crisis has been somewhat unique. Prices in Atlanta started from a much lower baseline than many other major markets. The prices escalated to a peak in advance of the financial crisis and have subsequently fallen back to the same levels that they were 10 years ago. Most of the other markets that experienced an inflation and deflation of prices like this are bubble markets that typically exhibit high prices relative to rents. In contrast to this, Atlanta represents more of a linear market with attractive rates of return available from cash flows that result from rent revenues. This is one of the primary reasons for Atlanta’s strength as an income property investing market.